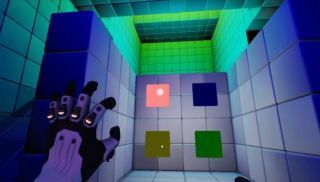 I was kinda hoping QUBE's new DLC would introduce a threat to its environments' sterility. Some rusting equipment here, a biohazardous blood spatter over there—you know, something that'd make the puzzler stand out, on first glance, as more than just a Portal wannabe. But hey, even if Against the Qlock isn't teeming with threats to one's health, it sure is stuffed with all of the colors . Because all of that sensuous hand-moving and dizzying environment fluctuation wasn't trippy enough, right? No time to gawp at the lightshow, though—you're pitted against a time limit in these ten new levels. Achievements, leaderboards, and level-by-level medal ratings also make their debut here, turning the puzzler into a potential bloodbath of one-upping. Well, we can hope. No word on a price point yet, but Against the Qlock's out on May 6 through Steam—and remember, the base game currently forms one-seventh of an Unreal bundle going for $20.